Additional Info: Commercial, Orchestral, Big Band Lead Trumpet player, I have a degree in Music & Education. I have performed in many large venues around the world in my 30+ years as a performer and teacher. I am comfortable within the genre indicated and at present working on my ability to improvise. I have a clear tone with good range and technical ability. 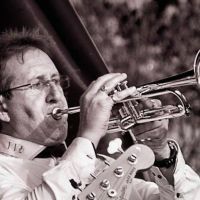 Registration is completely free and allows you to create an informative, searchable online profile at TrumpetProfiles.com.